Objectives The task force aimed to: (1) develop evidence-based recommendations for patient education (PE) for people with inflammatory arthritis, (2) identify the need for further research on PE and (3) determine health professionals’ educational needs in order to provide evidence-based PE. Methods A multidisciplinary task force, representing 10 European countries, formulated a definition for PE and 10 research questions that guided a systematic literature review (SLR). The results from the SLR were discussed and used as a basis for developing the recommendations, a research agenda and an educational agenda. The recommendations were categorised according to level and strength of evidence graded from A (highest) to D (lowest). Task force members rated their agreement with each recommendation from 0 (total disagreement) to 10 (total agreement). Results Based on the SLR and expert opinions, eight recommendations were developed, four with strength A evidence. The recommendations addressed when and by whom PE should be offered, modes and methods of delivery, theoretical framework, outcomes and evaluation. A high level of agreement was achieved for all recommendations (mean range 9.4–9.8). The task force proposed a research agenda and an educational agenda. Conclusions The eight evidence-based and expert opinion-based recommendations for PE for people with inflammatory arthritis are intended to provide a core framework for the delivery of PE and training for health professionals in delivering PE across Europe. Informal discussions among multidisciplinary HPs at the European League Against Rheumatism (EULAR) annual congress in 2012 and succeeding email correspondences revealed that great variety exists in the content and modes of delivery of PE across European countries. In some countries PE is still limited to providing knowledge in order to improve patients’ adherence to treatment. Additionally, there seems to be a large variation in HPs’ involvement in PE.15 To what extent different HPs participate in PE is likely to depend on their competency, availability and education, as well as the organisation of the healthcare system.16 Based on these initial discussions, an EULAR task force was convened with the following objectives: (1) to develop a set of recommendations for PE for people with inflammatory arthritis (IA) (2) to identify the need for further research and (3) to define HPs’ educational needs for providing evidence-based PE. The recommendations would allow standardisation and improvement of PE for people with IA across Europe. The target groups for the recommendations are rheumatology HPs including rheumatologists, patients with IA, policy makers and patient and professional organisations. The EULAR standardised operation procedures for the elaboration, evaluation, dissemination and implementation of recommendations17 were followed. The multidisciplinary task force comprised 15 experts including three patients, five nurses, two occupational therapists (OTs), two physiotherapists (PTs), a psychologist and two rheumatologists/epidemiologists with clinical experience and/or academic knowledge in the field of PE. They represented ten European countries (Austria, Czech Republic, Denmark, France, the Netherlands, Norway, Portugal, Sweden, Switzerland and UK). People who had taken part in the initial discussions, but were not included in the task force, were invited to participate in a ‘consultation group’. This group comprised 20 HPs, such as OTs, PTs, nurses and rheumatologists, but no patients were included. Before the first task force meeting in 2013 one of the members was tasked with reviewing the literature of existing PE definitions. An overview was presented and thoroughly discussed during the meeting. Common elements in the definitions were identified and the following definition was formulated, based on consensus among the task force members: “PE is a planned interactive learning process designed to support and enable people to manage their life with IA and optimise their health and well-being.” This interactive learning process includes a wide range of educational activities, such as provision of knowledge, written material, e-health, self-management programmes (SMPs), cognitive behavioural therapy (CBT), mindfulness, stress management, individual consultations with HPs, sharing experiences among patients, motivational discussions, exercise counselling, lifestyle change interventions and self-help courses. Moreover, the task force agreed that the recommendations should be based on the principle of shared decision making.9 Following this consensus process, the task force formulated 10 research questions to guide the systematic literature review (SLR) (see online supplementary file 1). An extensive systematic literature search in Medline, Embase, PsycINFO, Cochrane Library and CINAHL from January 2003 up to September 2013 of publications in English, German, French or Spanish describing any kind of PE activities, was conducted (details provided in online supplementary file 2). No limitations regarding study type or research design was applied. The inclusion criteria were IA, confined to RA, AS and psoriatic arthritis (PsA) and adults (age ≥18 years). All abstracts were independently read by two reviewers, and by a third reviewer in case of disagreement. The papers of the included abstracts were reviewed in full-text. Papers were excluded if they did not include any formal PE intervention (as defined above) or did not address the patient perspective on PE. The task force members were asked to review the final list of included papers and could add studies that were not captured by the SLR. The results of the SLR were presented and discussed during the second task force meeting in 2014 and eight recommendations were developed. The strength of each recommendation was based on the categories of evidence defined by the EULAR standardised operation procedures, graded from A (highest) to D (lowest)17 (see online supplementary file 3). The recommendations were emailed to each task force member for final independent voting and approval. The level of agreement was recorded on a 0–10 point scale (0=no agreement at all; 10=full agreement, table 1). In addition to the task force, the consultation group was invited to independently rate their level of agreement with each recommendation to obtain an indication of the agreement among people who are supposed to use the recommendations in clinical practice. Figure 1 shows the flow chart of the SLR. In total, 115 publications were included, comprising 11 systematic reviews/meta-analyses, 36 randomised controlled trials (RCTs) (reported in 44 papers), 7 controlled clinical trials (CCTs), 9 pre-post-test studies, 23 cross-sectional surveys and 21 qualitative studies. The majority of patients in the included studies was female (58–100%), diagnosed with RA (82%) and had relatively long disease duration (mean 6–16 years). Ten studies included patients with AS and/or PsA and five studies included only patients with early disease duration (<2 years). Flow chart of the systematic literature review (SLR). CCT, controlled clinical trial; IA, inflammatory arthritis; RCT, randomised controlled trial. Two overarching principles and eight evidence-based and expert-opinion based recommendations were developed, four of which achieved strength A. A high level of agreement was achieved for all recommendations; mean range 9.4–9.8 in the task force and 8.2–9.2 in the consultation group (table 1). 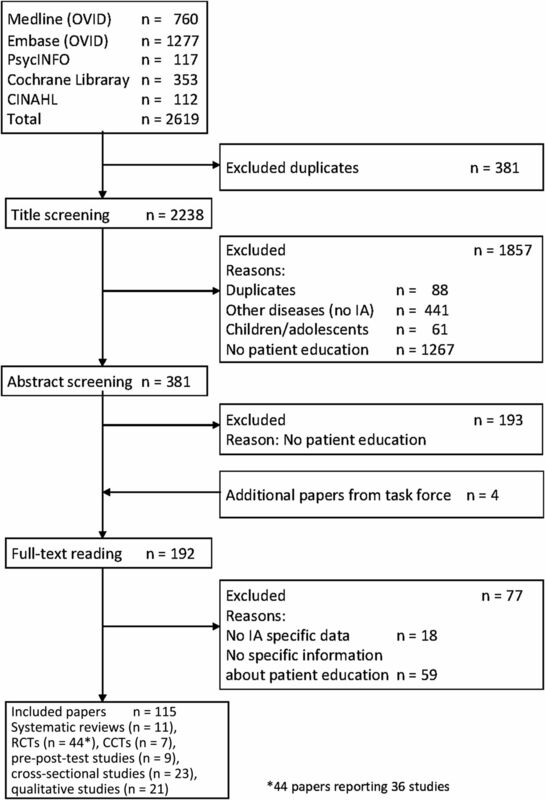 Finally, there was consensus in the task force that PE would increase patients’ involvement in their disease management, but this was only supported by one cross-sectional study,43 in which high levels of perceived knowledge of the disease were positively associated with involvement in healthcare. Various group interventions focusing on active coping with emotional distress and daily life stressors improved functional and emotional health status, patients’ coping strategies28 ,31 ,34–36 ,38–41 ,74 ,76 and perceived social support.85 Finally, two RCTs80 ,82 and one pre-post-test study83 demonstrated that interactive online programmes contributed to improvement in health status, pain, physical limitations and levels of physical activity. Recent systematic reviews have concluded that various group programmes (SMP, CBT and stress management) demonstrated small, but positive impact on self-reported physical activity levels, pain, disability, depressive symptoms, anxiety22 ,103 and fatigue104 at follow-up (4–18 months). Many of the PE programmes can be characterised as complex interventions, which intend to influence various aspects of the disease impact on life. It is challenging to find the outcome measure(s) that best capture these aspects and the outcome measures need to be carefully reviewed before evaluation studies are conducted. Box 1 presents the research agenda proposed by the task force, based on areas with only weak or limited evidence for PE. The two overarching principles (see table 1) should be applied when addressing each of these topics. To conduct economic evaluations of PE interventions (using PE-sensitive outcomes and effects in relation to healthcare resource use). Box 2 presents the educational agenda, which encourages the development of training programmes to enhance and support HPs’ opportunities to improve their educational competencies. Eight recommendations for PE for people with IA were developed based on a SLR and expert opinions. The recommendations were formulated to be practical and feasible for providing evidence-based PE across all European countries. The strength of evidence supporting the recommendations varies and a research agenda is proposed for areas with lack of evidence. A high level of expert agreement was achieved for all recommendations. An educational agenda was also formulated to support the development of competencies of HPs providing PE. The included studies showed a trend towards greater inclusion of behavioural, cognitive and emotional aspects in the PE programmes during the last decade. This trend is reflected in the PE definition that the task force formulated as an overarching principle, stating that PE should enable people to manage their life with IA and optimise their health and well-being rather than be limited to the disease. Some previous PE definitions have stated that PE is designed to improve patients’ health behaviours. However, the patient representatives in the task force felt that this was rather patronising and therefore it was not included in the consensus definition. The definition emphasises that PE is an interactive learning process, not a one-way delivery of knowledge. Substantial evidence has shown that interactive counselling, either in combination with group sessions or in one-by-one consultations with a competent HP, has beneficial effects in terms of adherence to treatment regimens, behavioural change, use of self-management strategies and well-being.19 ,37 ,49 ,72 ,108 In order to ensure the application of shared decision-making, HPs need to develop their communication skills, and patient representatives should be involved in all phases of designing, implementing and evaluating the interventions. Surprisingly, the SLR included only a limited number of studies on online PE programmes, but these showed promising results on health status and levels of physical activity.82 ,84 In our rapidly growing digital world, one may foresee that face-to-face-meetings will be more frequently replaced by online programmes, the impact of which will need evaluation. A limitation to the generalisability of the recommendations is that the majority of patients who participated in the included studies was female, diagnosed with RA and had relatively long disease duration. The task force recognises that at present there is limited evidence for patients with AS and PsA. It is therefore suggested that the recommendations should be regarded as “points to consider” for this population. Furthermore, little is known about special educational needs for men, patients with minority ethnic backgrounds and patients with lower literacy levels, which needs attention in future research. A great diversity in the type of educational programmes was observed, varying from interventions with a primary focus on increasing knowledge and improving performance, to more therapeutic oriented interventions aiming at behavioural change and improving mental health status.3 ,5 ,103 Also, a wide range of outcome measures was used and most studies reported multiple outcomes, limiting comparison of the effectiveness of the programmes. To be able to evaluate the programmes more stringently and to compare relevant interventions, the task force recommends harmonisation of outcomes, tailored to the programme goals and content and to the patients needs. Furthermore, the task force has proposed that existing outcomes should be evaluated, and new outcome measures should be developed, if needed. The task force was not aware of any unpublished studies with negative results. Nevertheless, due to publication bias some positive effects of PE may potentially have been overestimated. A methodological limitation of the SLR is that the task force decided to include all types of studies that could give insight in PE, resulting in a great methodological variety. Consequently, it was not possible to use one formal quality scoring system. Four recommendations were of strength A and the remaining four were of strengths C to D, that is, based on qualitative and cross-sectional studies or expert opinions. However, the qualitative studies may provide valuable insight into the individual patient’s needs and expectations, which should be regarded as the core of PE programmes. The use of a multidisciplinary task force, including patients, is one of the strengths of this study. Ideally, the task force should also have included a dietician and a pharmacist as the educational activities comprise lifestyle changes and adherence to medication. However, we believe that these issues have been addressed by the comprehensive SLR. Another strength is the high level of agreement with the recommendations among the members of the task force and the consultation group. However, the level of agreement will have to be further evaluated in a wider population of patients and HPs with interest and expertise in this field during the dissemination and evaluation of the recommendations. The task force agreed on a research agenda to gain further insight in the qualitative and quantitative aspects of PE, including working mechanisms of PE, developing and harmonising PE outcomes, economic evaluations and cross-cultural acceptability of PE programmes across European countries. The educational agenda states that providers of PE need regular updates of their skills in order to deliver effective PE. The task force proposes that training of educational skills should be integrated in EULAR courses for HPs and rheumatologists. Effective dissemination, implementation and evaluation of these recommendations across European countries demand a clear implementation strategy. Barriers and facilitators for implementation of PE as an integral part of standard care for all people with IA must be assessed within each country and appropriate support and education must be provided. This strategy will need further support from EULAR. In conclusion, eight evidence-based and expert-opinion-based recommendations for PE for people with IA were developed. The dissemination and application of the recommendations should allow establishment of core standards for PE across Europe. Further evaluation will be necessary to ensure relevance and effective application. The authors thank Kari Matre (medical librarian, Diakonhjemmet Hospital Library) for her contribution to the systematic literature review. The authors also thank the members of the consultation group for their involvement in the early conception of this project and for rating the recommendations. The consultation group consisted of Adewale Adebajo, Michael Backhouse, Ulrika Bergsten, Tricia Cornell, Jenny de la Torre-Aboki, Silvia Garcia Diaz, Ricardo Ferreira, Kjersti Gronning, Bernadette Hardware, Agnes Kocher, Marja Leena Kukkurainen, Ingrid Larsson, Azucena Pedraz Marcos, Andrea Marques, Jorit Meesters, Sue Oliver, David Pickles, Birgit Prodinger, Sarah Ryan and Karen Vinall.
. Arthritis education: the integration of patient-reported outcome measures and patient self-management. Clin Exp Rheumatol 2011;30:899–904.
. Methotrexate information booklet study 2008. Clin Exp Rheumatol 2009;27:649–50.
. Evaluation of the efficacy of an educational program for rheumatoid arthritis patients. Clin Exp Rheumatol 2009;27:28–34.
. Partner participation in cognitive-behavioral self-management group treatment for patients with rheumatoid arthritis. J Rheumatol 2004;31:1738–45.
. Influence of patient education on exercise compliance in rheumatoid arthritis: a prospective 12-month randomized controlled trial. J Rheumatol 2008;35:216–23.
. The information and support needs of people living with rheumatoid arthritis [abstract]. Rheumatology (Oxford) 2012;51(Suppl 3):iii159.
. A brief exercise and self management programme improves upper limb disability in people with early rheumatoid arthritis. [abstract]. Arthritis Rheum 2012;64(Suppl10):2439.
. People getting a grip on arthritis: a knowledge transfer strategy to empower patients with rheumatoid arthritis and osteoarthritis. Health Educ J 2010;71:255–67.
. Outcomes of a rheumatoid arthritis disease therapy management program focusing on medication adherence. J Manag Care Pharm 2010;16:593–604.
. Self-efﬁcacy: The exercise of control. New York: Freeman, 1997.
. Non-pharmacological interventions for fatigue in rheumatoid arthritis. Cochrane Database Syst Rev 2013;8:CD008322.
. “Delivering knowledge and advice”: Healthcare providers’ experiences of their interaction with patients’ management of rheumatoid arthritis. Int J Qual Stud Health Well-bein 2011;6:8473–81. Contributors HAZ was the research fellow for the project, undertaking the SLR; MN and AvT were the project convenors, AvT being the epidemiologist directing the SLR. All authors have contributed substantially by participating in the development of the recommendations, revising the manuscript critically for important intellectual content and approved the final version for publication. Funding This study was supported by the European League Against Rheumatism (EULAR), Grant reference: HPR024.